Living where you want to live can be the difference between feeling vulnerable or feeling safe; feeling isolated or feeling part of a community. As Jane Austen once wrote, “There is nothing like staying at home for real comfort.” Aging in place is defined by the Centers for Disease Control as “the ability to live in one’s own home and community safely, independently, and comfortably, regardless of age, income, or ability level.” Most people prefer to do so for as long as possible. But, loneliness, isolation and safety concerns are common experiences for older adults, especially those living alone. Smart home technology—devices that let you communicate with others, provide information and entertainment, and let you control your lighting, thermostat, or even your Crock-Pot using your voice or smartphone—is a rapidly growing industry seeing increasing introduction to homes. Generic smart home technology can increase independence for people of all ages, specifically those aging in place. In fact, the two are so compatible, that the trend toward aging in place may be one of the biggest catalysts of some of this technology. Devices such as smart locks, door openers and cameras can all serve as simple solutions to increase home accessibility and security, and to take visitability to the next level. Regarding aging in place, visitability is an important growing design approach for new homes, with the main principle that a resident or non-resident with mobility difficulties, who perhaps uses a wheelchair or other mobility device, should be able to visit or live in the home. While the base requirements for visitability are widened doorways and hallways, 0-step entry, and a half bath on the first floor, there is even more than can be done to make hosting easier for the resident. For example, an older adult with mobility issues may have a difficult time making it to their front door quickly after they hear their doorbell or a knock. With an automated door opener, they can unlock and open their door from anywhere in the house using a smart device and/or voice command. Various devices with cameras can increase an older adult’s safety when located both inside and outside of their home. Smart doorbells on the exterior of the home, such as Ring, allow you to see who is at your door without having to physically go to the door, which can be especially helpful when mobility is limited. Amazon Echo Showallows for video calls with family that are as simple as saying the words, “Alexa, call my grandkids.” In-home cameras, like those available through Nest, can ensure your loved one is being well-cared for by in-home care providers and that they are safe inside their home when no one is with them. However, it is important to note that there is a fine line to balance between respecting your loved one’s privacy and being able to see at-will into your loved one’s home. Cameras can cause privacy concerns and warrant a discussion with the elder adult before installation. Review the implications of adding cameras inside, and make sure the individual understands and has given permission. Falls are always a major safety concern associated with aging, especially for those living alone. Smart home technology includes the ability to use one’s voice to also turn lights on and off. Being able to turn a light on with your voice can eliminate the need to walk to the switch in the dark if it is not nearby, ultimately helping to prevent falls by having a well-lit room before moving about. Smart hallway lights with motion sensors turn on when the individual gets up to use the bathroom in the night. If someone does fall and cannot get back up, they can call for help using a smart automated assistant such as Amazon Alexa, Google assistant or Apple Siri. Once someone arrives, the person needing help can use their voice to open the door and let the person in to assist them. Smart home technology also allows for many types of automation that, after set-up, take little or no effort on the part of the resident. For instance, wearable fall sensors automatically send an alert to a loved one’s smartphone when they detect that the user has fallen. Door sensors can send alerts when the older adult leaves the home, in case there are concerns for wandering. Smart lights can be programmed to turn on in the front hall and on the porch when the resident pulls in the driveway with their smartphone. For older adults becoming forgetful, there are smart home devices that can provide reminders. 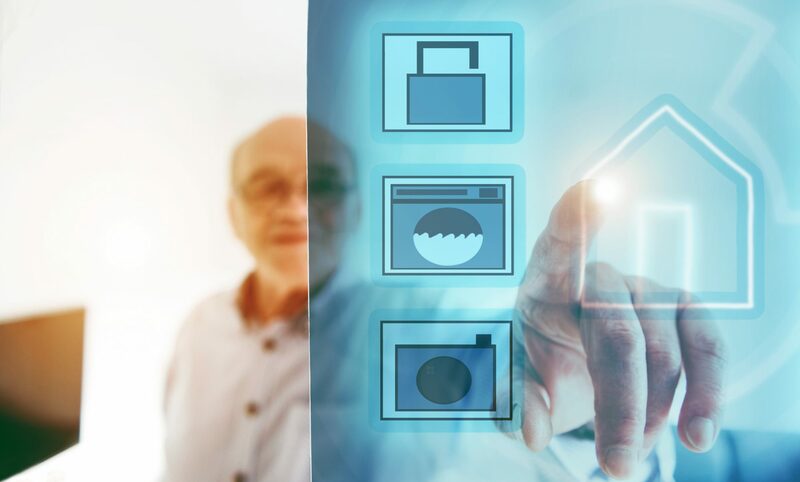 Smart appliances can track items in the refrigerator, pantry and pill cabinet when there are concerns about the older adult not eating enough and/or forgetting to take medications. These appliances provide notification and warnings depending on conditions they are set to monitor, such as using the sending an alert to a smartphone if pills are not taken on schedule (see PillDrill for an example). In addition, if an older adult has someone shop for them, they can tell the automated assistant in a smart device to add items to their shopping list via voice command, and the shared list will be instantly updated in the shared app. Smart home technology can be intimidating, and change can be uncomfortable. Older adults grew up with less technology than today’s youth and often feel apprehensive, lacking confidence when using automated devices. However, with the growing market of smart home technology that is activated by a simple voice command or set up to be completely automated, older adults are being asked to step less out of their comfort zone in order to reap the benefits. Once someone gets comfortable speaking to a device, there is little training and few changes necessary to the person’s habits and lifestyle. There are also friendly instructive videos and apps to support those less comfortable with technology as they increase their tech confidence and savvy. Ultimately, generic smart home devices are costing less and less, and are becoming more and more user-friendly. For those aging in place, these devices help them improve their independence and quality of life, no matter their age or ability. Want to learn more about aging in place with technology? Check out the Aging in Place Technology Watch blog.And, of course, you can learn more about smart home technology and how it’s being used as assistive technology for both older adults as well as people with disabilities at our website: SmartHomesMadeSimple.org. Interested in smart home technology but not sure how you can afford it? Give us a call. We have extensive experience with available funding resources and can help you find what you need and afford it, too. Previous PostPrevious Will Alexa Understand Him?